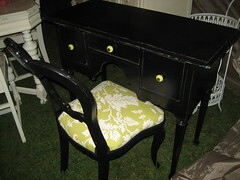 Yes, we even paint fabric! 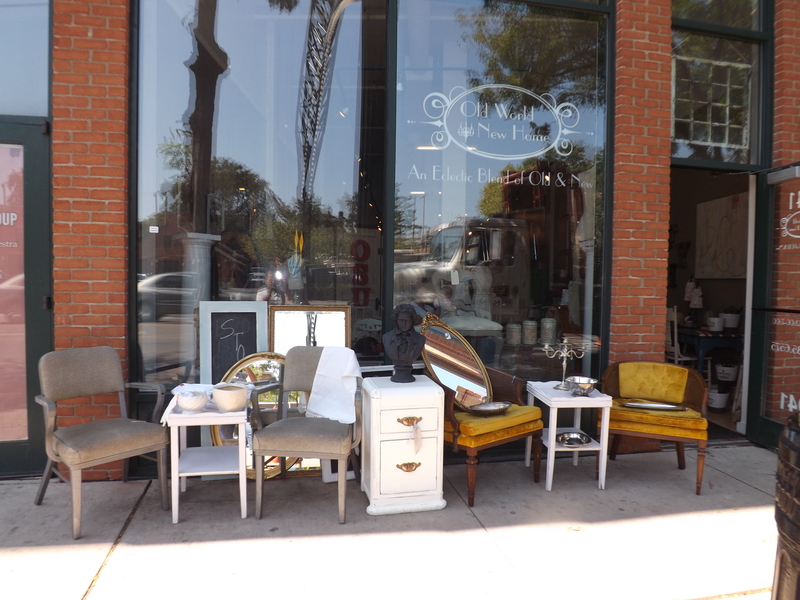 Wood, laminate, brass, marble, iron….we paint everything! And we never do any priming or sanding prep! 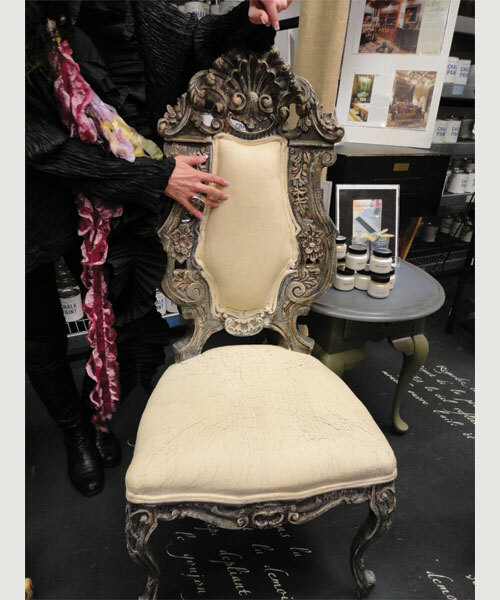 That is the beautiful thing about Chalk Paint® decorative paint by Annie Sloan, the possibilities are endless! Even fabric! 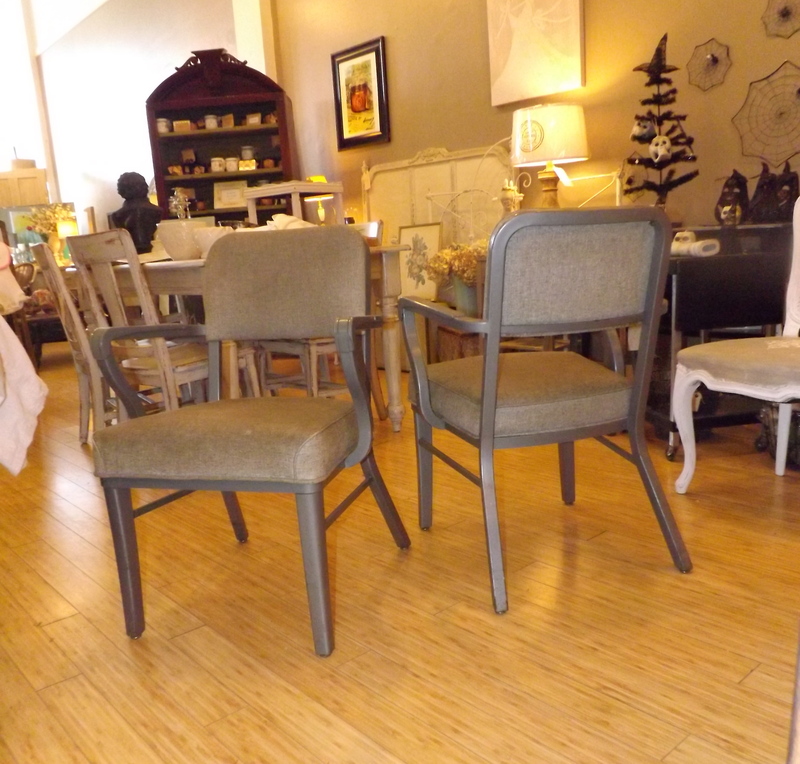 If you remember the pair of chairs we scored from our pick in our previous post, they are vinyl shop chairs. 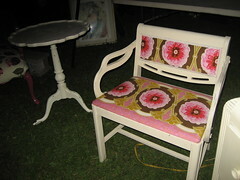 Before we used Annie Sloan Paint products, this chair would look like a huge upholstery project! Now it looks like a couple of hours of painting and then done! First thing, we cleaned up the steel and vinyl with soap and water to get off surface dirt. That’s all the prep that is needed before painting! 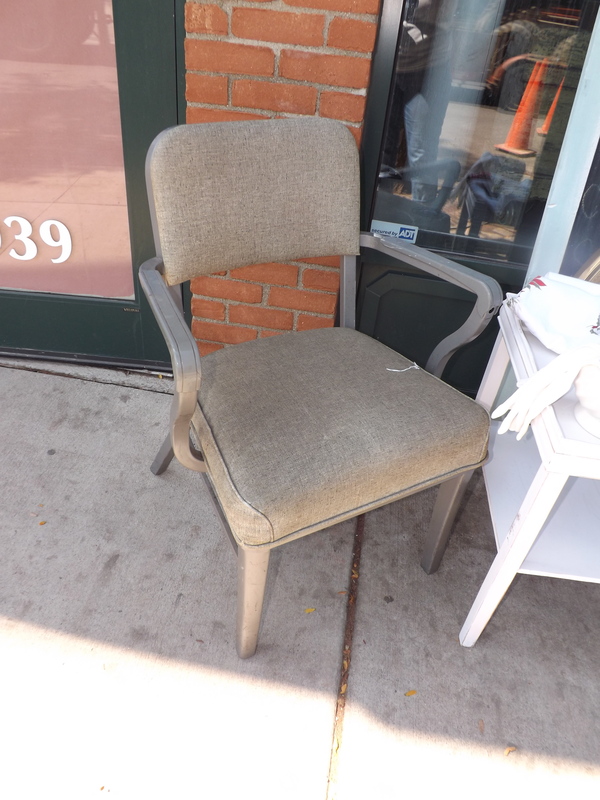 I like the metal the way it was, so just needed to figure out which paint color….how about our current favorite, Country Grey! 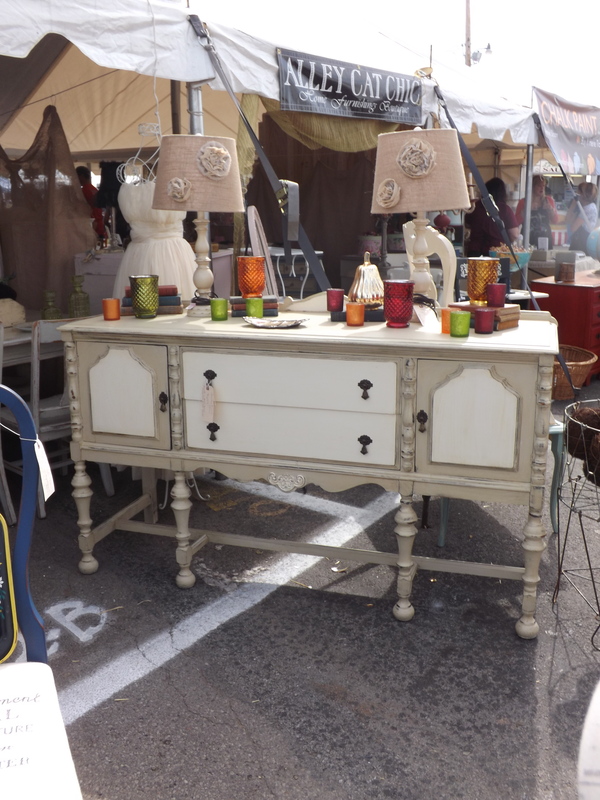 Our first piece we finished in this color was a two toned buffet with Country Grey and Old White and after that it was love! Country Grey Buffet with Old White Accents. 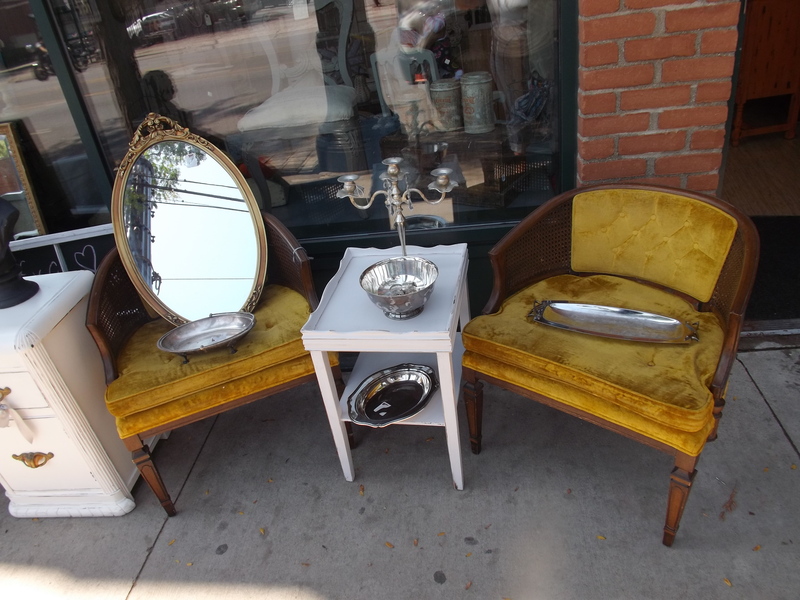 Photo taken at the September Vintage Marketplace at the Springfield Antique Show and Flea Market. 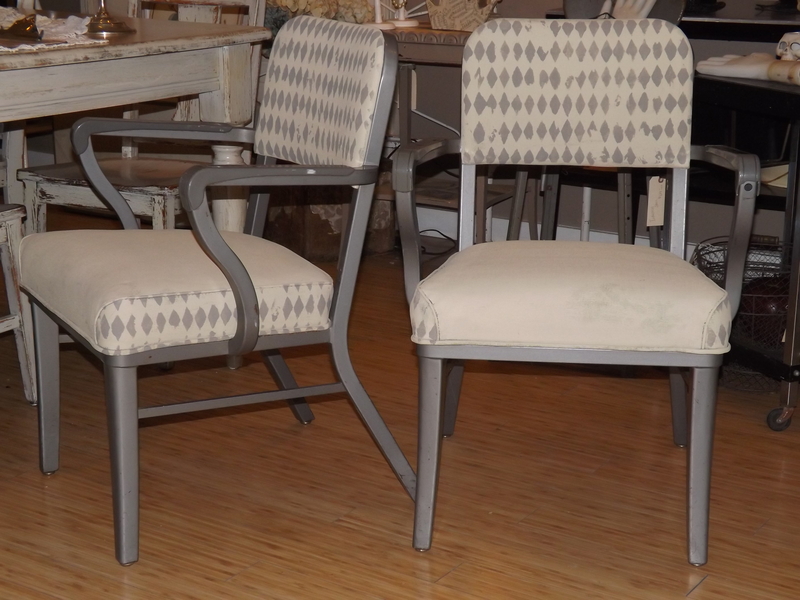 Back to the chairs….so we took off the top and bottom vinyl pieces (I need to get better about taking in progress pictures…but I just get so excited that I forget and keep painting!) and painted them all Country Grey. 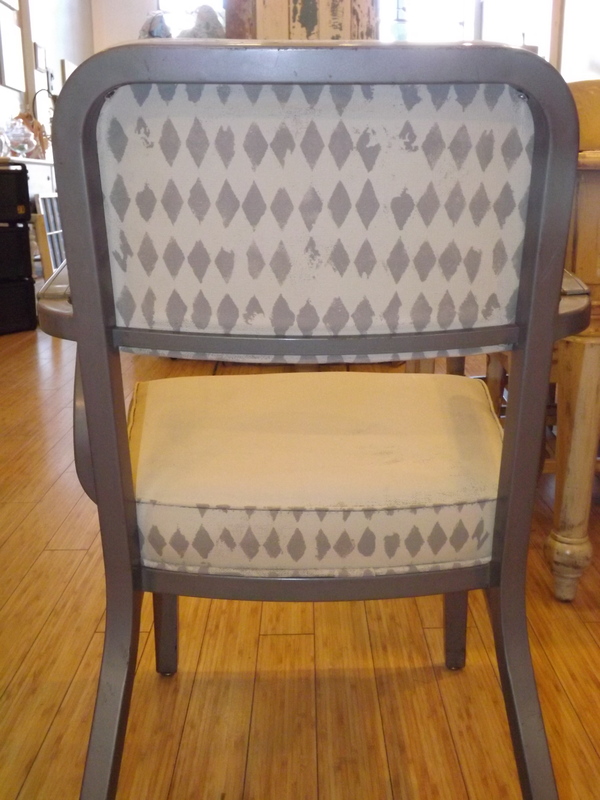 We wanted to add a little pop of pattern and we have this great distressed diamond pattern stencil. To keep it monochromatic, we chose French Linen for the diamonds. I LOVE the end result! 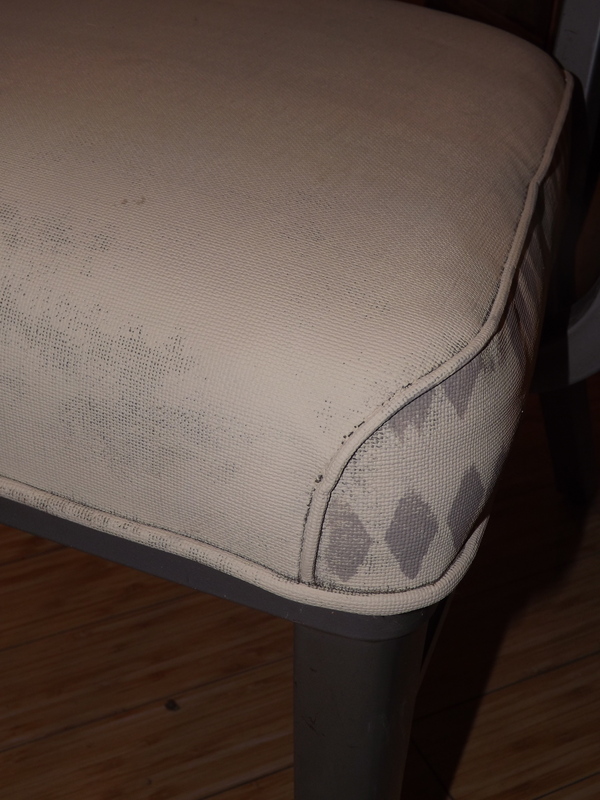 We didn’t want to cover the entire seat with the stencil, so we just did the sides inside the piped edges. It keeps it simple but gives it a nice little pop of detail. I purposely didn’t let the paint soak into all of the vinyl because I love the worn look. I CANNOT wait to try this…. 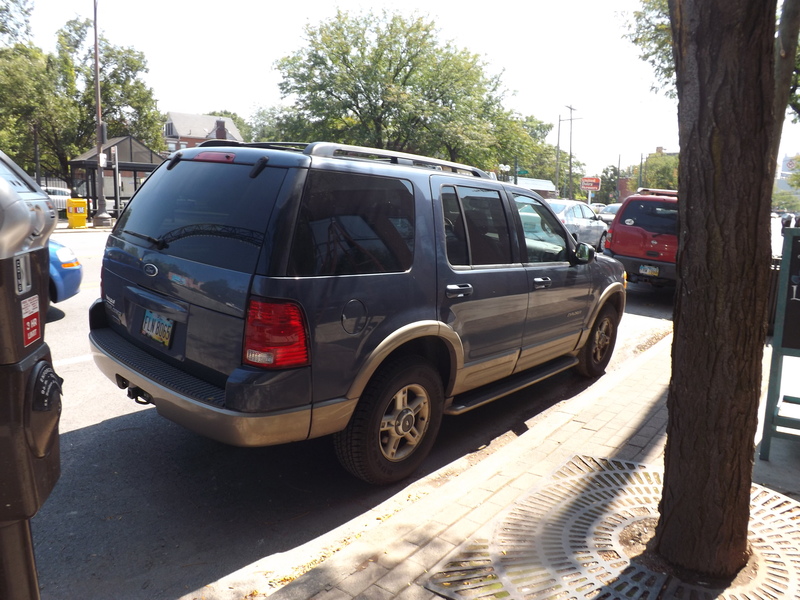 How much can you fit in a Ford Explorer? !…..another day, another pick! 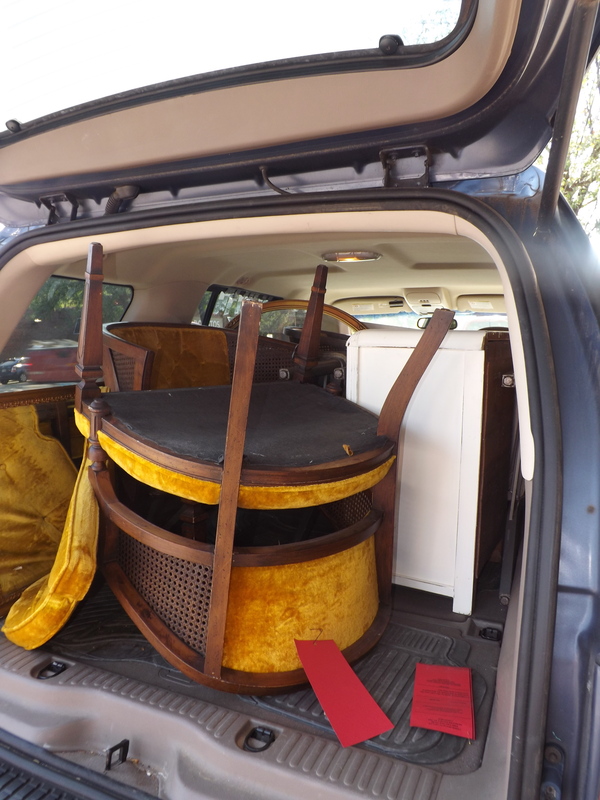 He of course is right…so Mom and I head to pick up our “2 chairs” we bought at an antique mall. Even though we were just there a few days prior, we drove ALL the way there…(10 minutes)…we might as well look around again right?! And with no baby with us, that means no car seat, so we have plenty of room for a couple other items. 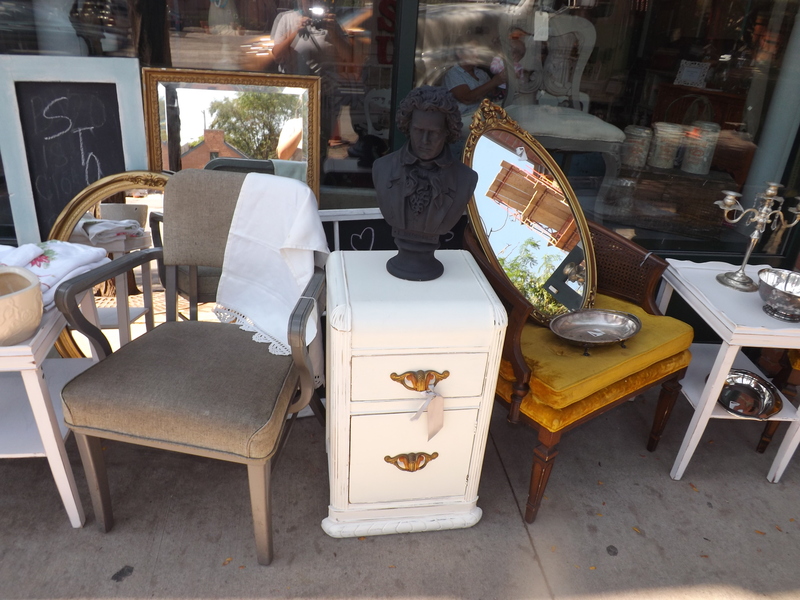 A “couple” of items and 2 hours later we managed to fit the 2 chairs we came for, 2 more chairs, 3 end tables, 2 big chalkboards, several pieces of vintage white pottery, 3 mirrors, lots of yummy old silver pieces, some table linens, and of course a bust of Beethoven! 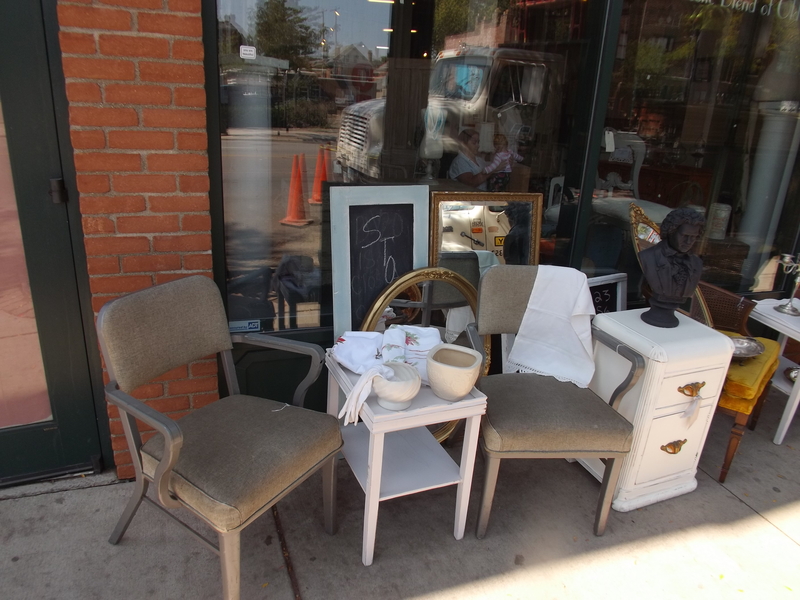 2 shop chairs from an old Columbus electric company are awaiting a major makeover because you can even paint Vinyl with Annie Sloan Chalk Paint(TM)!! 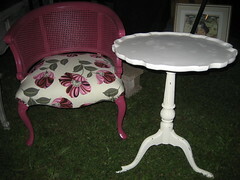 Pretty antique waterfall end table already painted and ready to go! The culprits!! 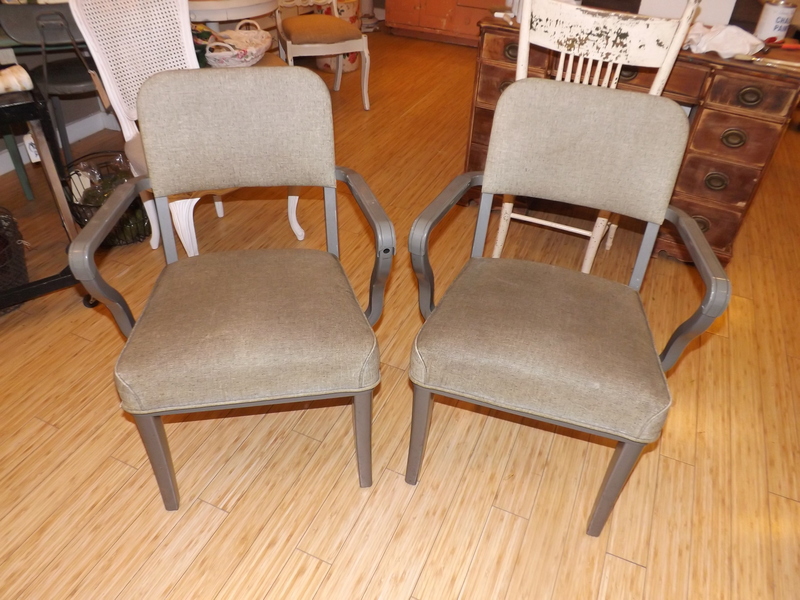 The 2 chairs we were going to pick up! Such a great afternoon of pickin’ at one of our favorite places! Now what to start on first?! 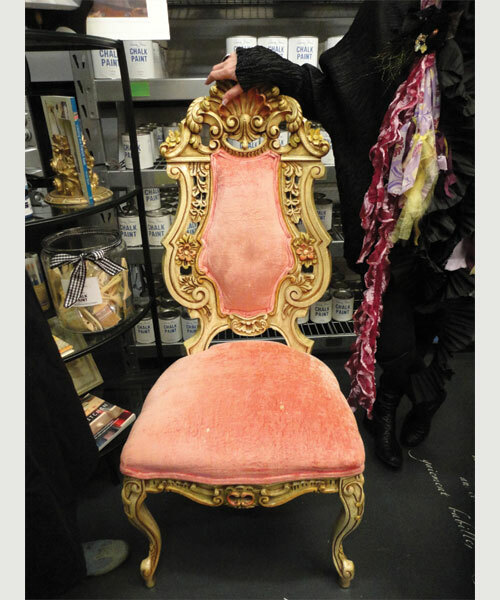 I think it has to be the metal and vinyl shop chairs…pictures to follow! Our whole “pick!” Not bad for 2 hours and one car load!